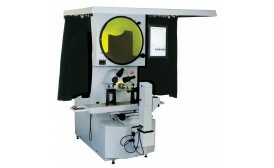 This vertical 350mm / 14" screen bench projector features a large, heavy duty high precision workstage with 250mm x 125mm measuring range and 0.5 micron resolution. 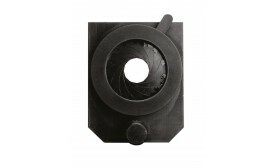 Another feature is the option of a three lens turret for instant lens changes without re-calibration. The Venture Plus range includes all of the standard Venture features with a little more... measuring range, that is. 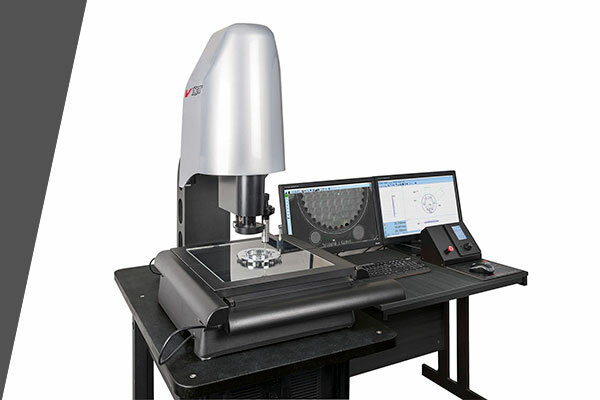 The Venture XT- CNC has Fusion 3D software, a 300mm x 300mm x 200mm XYZ stage and includes a controller and 2 x 19 inch monitors. Venture CNC models take the power of fusion software one stage further by completely automating the inspection process. Now advanced features like scanning and best fitting can be done quickly without taking up the time of skilled operators. CNC programming is a simple teach and repeat process. Just measure the part once and a full CNC program is created automatically. 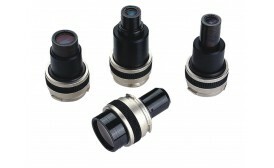 The zoom lens can also be controlled so that magnification and auto focus changes are all recorded into the program. 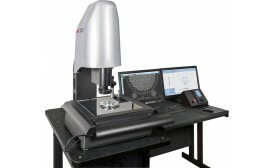 CNC Functionality The use of a touch probe is optimised on a CNC system. Measurements from data points taken using the touch probe can be combined with those taken using video edge detection for optimum speed and reduced inspection times. A probe changer rack can be installed so that probe modules fitted with a variety of pre-calibrated styli can also be used in the same inspection. When a change of stylus is required, the system automatically puts the current probe module back in the rack and picks up the next to continue the inspection process. When programming using the touch probe, use only the minimum points required to define each element. Then simply edit in the optimum number of points for each element. The new probe path is then automatically created when the program is played, cutting down both programming and inspection time. Alternatively, features can be programmed directly from an imported 3D CAD model. The BATY VuMaster is a 2D vision system with a massive difference. Due to its innovative absolute 2D scale system, the newly designed VuMaster does not have a conventional moving stage or encoders - just a floating measuring camera that moves anywhere in the measuring range. The result is fast, accurate, ‘non contact’ measurement over a much larger measuring range - 400mm x 300mm. Because the camera moves and the part stays still, there is often no need for expensive and time consuming work holding devices. VuMaster is either operated manually or inspection routines can be recorded and stored. When played back, these ‘programs’ either run automatically, (CNC). or guide the operator through a pre-defined inspection procedure recreating the same lighting conditions and using ‘Video Edge Detection’ to automatically ’capture’ feature data. Finally, a report is generated in the form of a fully dimensioned drawing of the measured part. 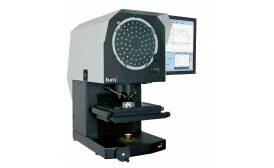 The Baty R400 bench mount profile projector with its 400mm screen combines high accuracy non-contact measurement and inspection with a large 300mm x 150mm measuring range. Choice of digital readouts and optional automatic profile edge detection ensures that you can have the projector that fits your requirements. The horizontal light path configuration is ideally suited to turned machined parts that can be secured to the workstage using a range of optional accessories from the Baty fixture family. The robust design of the R400 makes it suitable for both the shop floor and the standards room. 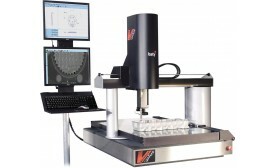 The Baty R600 with its 600mm (24") screen and high specification presents the capability to make simple comparative non-contact measurement through to complex programmed measuring sequences with SPC capability and automatic edge detection. The horizontal light beam configuration is ideally suited to large machined or turned workpieces for mounting in vee blocks and centres. Fusion metrology software has been the foundation for Baty's camera based inspection systems for the last decade. The combination of ease of use, advanced edge detection and graphical reporting has established this remarkable software as the standard by which other vision packages are measured. 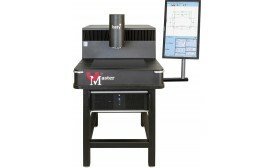 GMR: • Geometric measuring functions including skew • Integrated screen protractor display • RS-232 data output for PC or printer • Cartesian / polar coordinates • Zero, abs/inc mode • Inch / metric selection • Bright easy read LED display GXL: As XLS with geometric functions for skew alignment, angle, radius, point, line, circle. Automatic feature list and graphical view. Macro programming facility guides the operator through the measurement process. Feature tolerancing and standard report printout. Footswitch compatible. GXL-E: As GXL with profile edge sensor to take data points automatically. Eliminates operator error and speeds up inspection times. FT-2: Complete TOUCH SCREEN DRO with 2D Fusion touch software for projectors with full geometric functionality. Graphical view of measured part can be printed as a fully dimensioned drawing with geometric tolerances. Other graphics include form error and SPC charts. Full reporting capability includes tabulated details with pass / fail analysis, auto link to Excel and auto sequence programming feature. SPC and best fitting to dxf (overlay). Windows O/S and built in 19" portrait touch screen monitor in a rugged all steel housing. FT2-E: Complete TOUCH SCREEN DRO with 2D Fusion touch sw. Full geometric functionality. Built in optical edge detection allows data points to be taken ‘on the fly’ as the projected image is passed under the screen mounted fibre optic sensor. View of measured part can be printed as a fully dimensioned drawing. Full reporting capability includes, SPC, tabulated details with pass / fail analysis, auto link to Excel and auto sequence programming feature. Windows O/S and built in 19" portrait touch screen monitor in a rugged all steel housing.